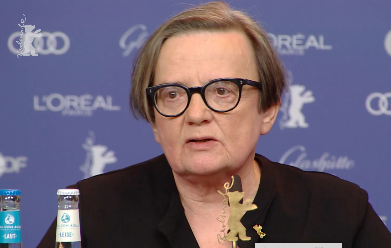 Although director Agnieszka Holland scatters clips of George Orwell (played by Joseph Mawle) typing his manuscript for Animal House throughout Mr. Jones, she could just as tellingly (apart from commercial considerations) have inserted the rantings of any contemporary would-be autocrat. Her based-on-true-facts film takes place in the early 1930s. Welsh journalist Gareth Jones (James Norton), derided by British politicians for his warnings about the rise of Hitler — he was the first journalist to interview the German führer — resulting in his ouster as an adviser to Prime Minister David Lloyd George, decides to make his way to Moscow in hopes of arranging an interview with Stalin. He has a friendly contact in Moscow, a fellow journalist, who he believes can help him arrange the interview. Arriving in the Russian capital, however, he learns that the journalist has just been killed during an alleged robbery. 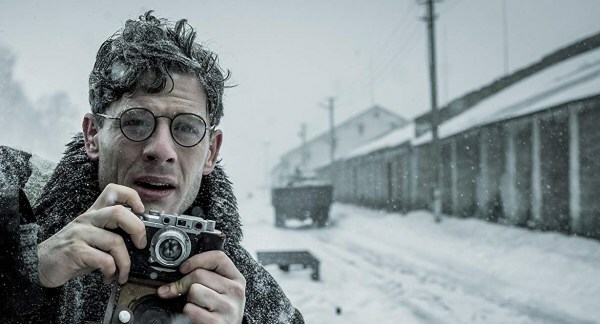 He also discovers that other foreign journalists are being trailed by Stalin’s secret police, that their dispatches are monitored and censored, and that their phones are being tapped. He also becomes aware that the economic “miracle” of Stalin’s Five-Year Plan, which included the forced “collectivization” of Ukrainian wheat farms, may be mostly propaganda and that his deceased friend may have been killed after Soviet authorities learned that he was investigating rumors that the botched economic strategy had resulted in widespread famine in Ukraine. However, when he encounters Walter Duranty (Peter Sarsgard), the New York Times‘s bureau chief in Moscow, he is advised to tread carefully, that Stalin’s efforts to improve the lot of the people will brook no interference. Duranty, it turns out, is as famous for his Moscow orgies as he is for winning the Pulitzer Prize for his “Our Man in Moscow” column for the Times. 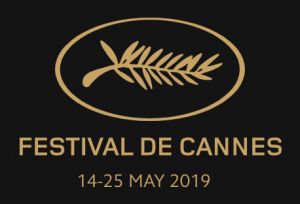 Invited by Duranty to one of them, Jones learns that his late friend was on to something of potentially earthshaking consequence and decides to make his way to Ukraine himself. Giving his minder the slip, he begins a harrowing trek on foot through Russia’s “breadbasket” — which, he observes, has become virtually empty and has resulted in possibly millions of deaths from starvation. In the end, he is arrested with six British businessmen on charges of espionage but allowed to return home with the warning that if he attempts to write critical accounts of his trip, he will imperil the lives of the businessmen. He decides that the lives of millions of Ukranians are at greater risk than those of the six businessmen and begins to speak out and write about his experiences, only to be denounced as a liar by Duranty and other pro-Soviet journalists. Red-carpet attendees at premiere of Mr. Jones were handed these sheets of paper and asked to display them. 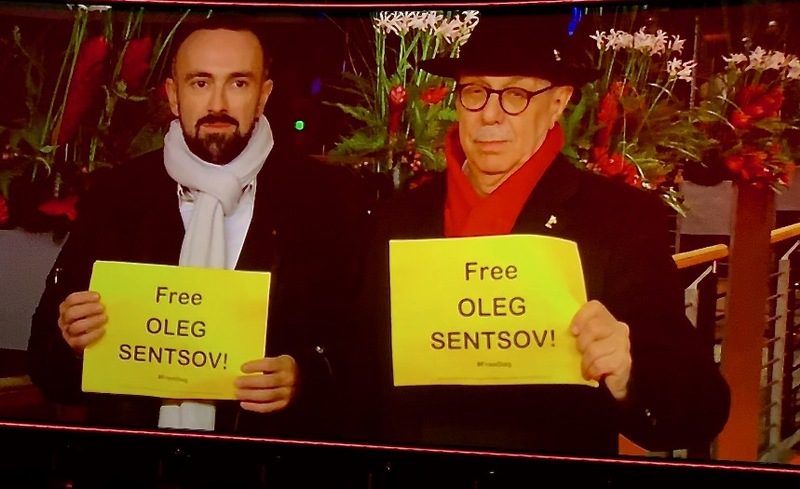 Ironically, as the audience arrived on the red carpet for the Mr. Jones premiere, they were greeted by demonstrators passing out sheets of paper on which were printed the words “Free Oleg Sentsov.” Sentsov is a Ukrainian filmmaker and writer who was sentenced in Russia to 20 years in a Siberian prison on terrorism charges (for which no evidence was ever submitted) after protesting the Russian annexation of Crimea, where he lived and where he was arrested in 2014. In December, the European Parliament, at a ceremony in Strasbourg, awarded him in absentia the 2018 Sakharov Prize for Freedom of Thought.